Since my Fighting-the-Climate-Deniers Quiz launched September 21st on Grist.org (followed by ThinkProgress, DeSmogBlog, and my website) the quiz has been taken more than 3,346 times. Wow! And the numbers just keep going UP (See counter below) thanks to people like you who are spreading the word, and blogging about it too. But I wondered… Just where are these courageous climate fighters located? 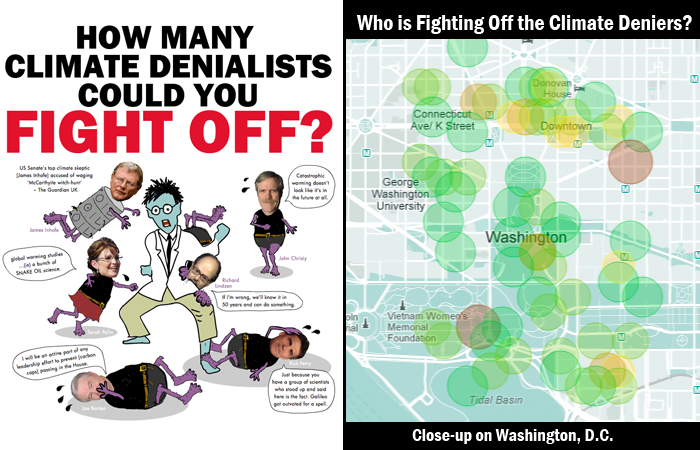 The Quiz Results Map: How many climate deniers could you fight off? So, what do the results tell us? Lots and lots of people around the world are ready and willing to fight off the denialists! The map shows that the quiz has spread to every state in the US, most parts of Canada and every continent in the world (except Antarctica). While the quiz is mainly for entertainment purposes, (and we strongly suspect that some people may have taken the quiz multiple times, and given different responses just to “test” the scoring system) we can see that there is tonnes of enthusiasm for fighting off climate deniers! We are not alone. If you hover over the dots you can see scores for a particular area. The dark green colour is for the higher scores, while the brown dots represent low scores. 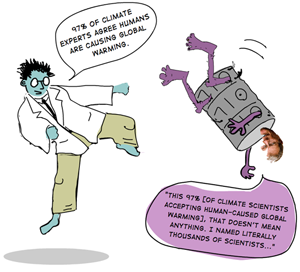 Take the Quiz: How many climate deniers could you fight off? 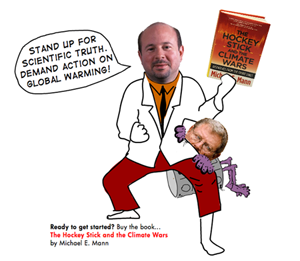 Lloyd Alter on Treehugger features the Quiz: How Many Climate Deniers Can You Fight Off? Inspiration for this zany quiz came from Matthew Inman, The Oatmeal. OK, I just checked. My IP address does not even resolve to the state I live in. 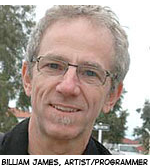 In some cases an ISP will have an IP with a totally different location — as in your case. But anyway, yes, I think my IP address is one of many for a large cable company that would resolve to be one of their corporate data processing centers, or whatever. Which is good, because it gives a false impression of where we are all actually located, which significantly enhances our chance of success when carrying out these battles.